Most of the websites we build are based on WordPress platform. It’s an open source content management system that is quite popular around the world due to its simplicity and ease of use. 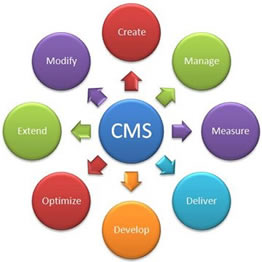 Content Management System (CMS) is widely popular due to its simplicity and ease of use. It’s something we include in almost all our websites, whether you opt for Ready To Go site, or opt for a Custom Designed site for you; you’ll find using and maintaining the website very easy in the long run. What is a content management website design? In simple terms, CMS website design allows you to easily manage or publish content on your website by just logging into the admin section of CMS website. Once you’re in you can manage website content with fully intuitive and easy to operate control panel. No prior technical knowledge or programming skills are necessary. What are the benefits of CMS website design? A CMS website design is based on content management system that guarantees maximum efficiency to users as process of publishing content does not require any knowledge of designing or coding. Additionally, its easy workflow ensures complete control over CMS website. Another benefit of CMS is that it comes with pre-built SEO features that help improve ranking on major search engines. All in all, a robust CMS is a must if you want to make your life simpler and get quicker results. Who requires a CMS website design services? Anyone who needs to update his website on almost daily basis and do not want to use the services of a web designer each time can benefit from CMS website design Company. What are the contents that you may have to update on a regular basis? Content in the form of articles, news, blogs, announcements, products or image galleries etc need to be updated using CMS web design service. WordPress is definitely one of the best open source web management software that can help in creating stunning websites that can quickly draw visitors. We always prefer it because it’s so easy to use. You can also get thousands of plugins to do anything you can think of. These plugins help improve and extend the core functionality of the CMS software and can also add more functionality and features to your website. You can easily install these plugins from the Internet. They can also help display Twitter tweets, create your social network, including videos from YouTube, you can even monetize your blog, flash gallery, and so on. Our team can either customize available templates and themes on open source CMS as per your specifications or can create new themes to suit your individual business needs. Whichever way you choose, we guarantee expressive, clean and user-friendly theme designs. Our fully customized web designs and workflow helps you by making your website and its content presentable. Our team only displays what’s impressive. Our in-house seasoned team ensures that every project is extensively tested before its delivery so as to avoid any surprises. Speak to one of our experts today and unlock your online potential! You can email us at: bob@itglobalsolution.com for all your website need.